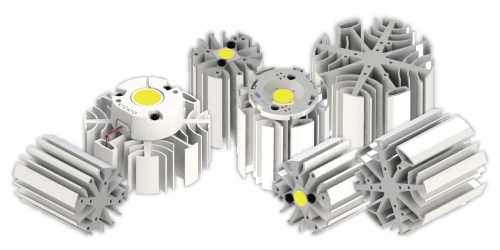 For spot and downlight market – designed from a designer perspective up from 900 to 6,100 lumen. For industrial flood lights,high bays and high mast applications up from 15,000 to 60,000 lumen. Lumileds, Ledil and MechaTronix joined forces to create 2x6 emitter platform - CoolBlock® 2x6 LX. With its headquarter in Kaohsiung Taiwan, a high-end R&D hub in Taipei Taiwan and global distribution facilities in Hong Kong and the Netherlands, MechaTronix leads the world of high-end LED cooling. From a spotlight cooler of a few thousands of lumens all the way to the top light for the national football arena, a wide range of LED coolers have been made standard off-the-shelf available. An in-depth knowledge of thermal management combined with a passion for lighting and aesthetics leads to the exorbitant market position MechaTronix occupies today. We challenge you to go arm-in-arm with us through your next LED cooling design and guarantee you a unique journey.